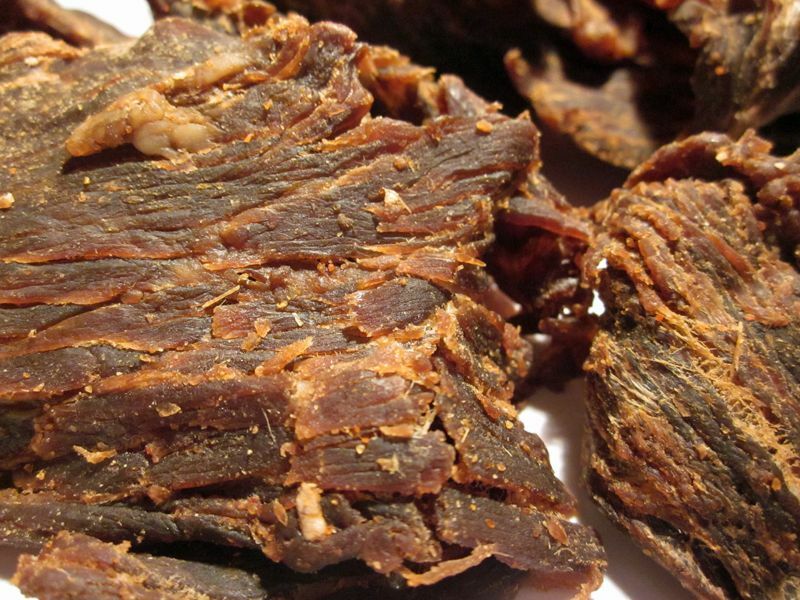 A Google search of SlantShack Jerky brings up dozens of news reports with the kind of fanfare and freshness that only Silicon Valley entrepreneurs seem to get these days. SlantShack's website shows a staff of eight people and five consultants while most small jerky brands have only a husband/wife team running the whole show. The packaging states that their jerky is manufactured by Vermont Highland Cattle Co., which I assume means their jerky is made from highland cattle, which I understand is some of the most sought after beef in the world. They also offer a "Build A Jerky" feature where you get to choose your jerky upgrades and options. "The Original" appears to be their most basic variety. I also have another package of The Original with Jerk McGurk's Wild Rubdown, and their Hot & Smoky with Brown Sugar Glaze to review in the coming weeks. Beef, soy sauce, worcestershire sauce, brown sugar, white vinegar, honey, molasses, ginger, real garlic, liquid smoke, onion powder, cumin. The first thing I taste from the surface of these pieces is a worcestershire flavor, but with some tanginess, sweet, and some other seasonings mixed in. The chewing flavor starts with much of the same, but with a little more tanginess, and a little bit of a natural meat flavor. The worcestershire sauce seems to produce the primary flavor of this jerky overall, but just enhanced with additional flavors. There's a well noticeable tanginess, reminiscent of lime that mixes into that worcestershire, but most likely originates from the vinegar ingredient. In any case, it livens up the chewing flavors. I can also pick up small bursts of ginger as my teeth bite into tiny bits of it laden on the surface of these pieces. The sweetness is noticeable, but still overall light. 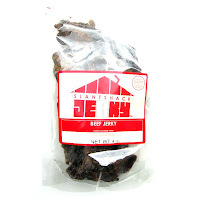 You're not going to find this jerky sweet in general, but there's just enough in there to add some body to the overall flavor. The natural meat flavors are light, but just enough to be enjoyable. If you're snacking away on this while doing something else, you might not even notice the flavors through the heavier worcestershire and tanginess. But in analyzing this the way I am right now, I can definitely distinguish it. The cumin is also well noticeable. The other seasonings, onion and garlic, are not easily identifiable on their own, but seem to mix in with the base and help create a very unique, and savory marinade. Overall, what you're going to notice in this jerky is a dominant worcestershire sauce flavor, a good deal of tanginess in the chewing, with a light sweetness, random bursts of ginger, and some cumin. This is a semi-moist jerky, with a semi-moist surface feel. These slabs are very flexible, being able to bend a full 180 degrees on itself with no cracking. Tearing these slabs apart with my fingers is very easy, and chewing seems very easy as well. The chewing texture starts out feeling soft and moist, with just a little chewing resistance. It chews down to a soft mass quite quickly and easily, and at that point, it feels very much like chewing a piece of steak, one cooked well-done, though more tender. I found several streaks and bits of fat on these slabs, enough to create a fatty flavor where I bit into some. I also found streaks of gristle which created some rubbery chewing, and remained in my mouth as unchewable wads of tissue. There's also a fair amount of stringiness in this, which also remains behind as unchewable. In terms of clean eating, my fingertips didn't pick up any moist or sticky residue, but in tearing these slabs apart, I'm getting a good deal of meat fragments flying off on to my lap. 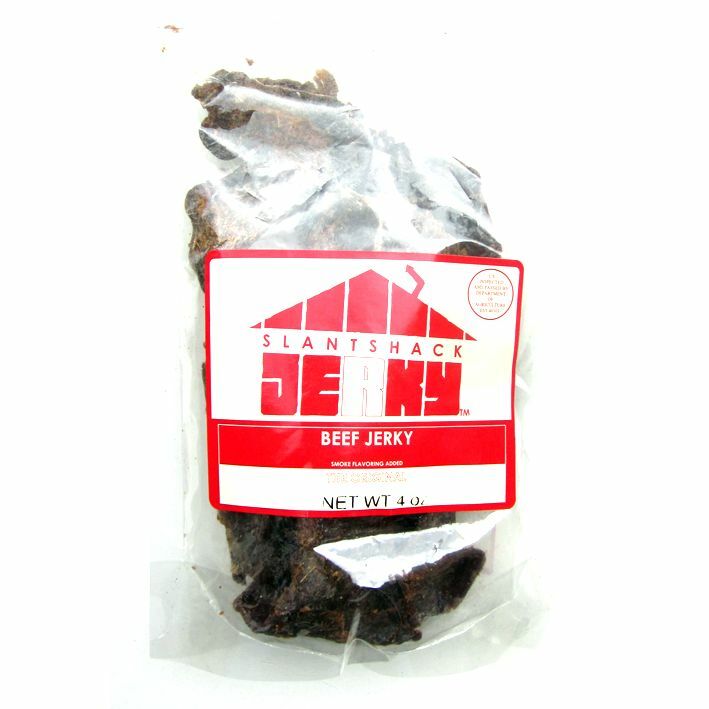 Slantshack Jerky sells this The Original variety through its Build A Jerky website at a price of $10.00 for a 4oz package. Shipping is approximately $6.00. If you bought four packages, it would total $46.00, or a price of $2.88 per ounce. 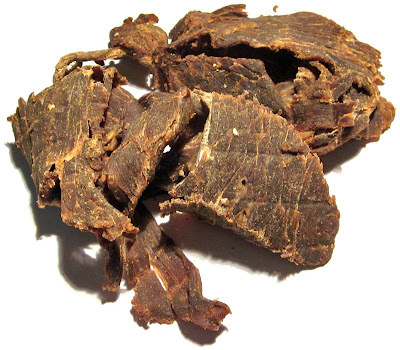 For general jerky snacking purposes, at the $2.88 price per ounce, it's a good value. I'm getting a lot of snackability from its great overall flavor, easy eating, and good chewing texture. That price is substantially higher than major brands of jerky you'd find in grocery stores, but is clearly better in flavor and meat consistency. This The Original variety from Slantshack Jerky offers up an addicting base flavor that starts out with worcestershire sauce, but adds to it with a savory blend of seasonings, primarily the ginger and cumin, along with a tanginess from the vinegar that really livens up the chewing. I was also pleased to get some natural meat flavors out of this, though it seems the marinade and seasonings are still the key players in this jerky. Also a plus is it's easy tearing and chewing, and good chewing texture. I didn't care much for the streaks of gristle running through these slabs which hindered the chewing. But I still felt the great flavor created the "wow factor" I typically look for in a Best-rated jerky, and the good chewing texture and easy eating are bonuses. Most brands usually offer up a rather basic jerky flavor for their original varieties, but this original offering from SlantShack Jerky is anything but basic. My recommended beer pairing for this, I'd go with a porter. I think you'll find the smoky, roasted malt flavors matching up well with the pungent worcestershire, vinegar, and ginger flavors. Try the Anchor Porter or the Stone Smoked Porter. I've been buying this jerky for a while. It's excellent. My kids love it. It's great for car rides and we also like to bring it on the ski slope. I'm going hiking with the Boy Scouts this weekend and I'll be bringing some along the hike. I just bought every flavor they have and honestly, I don't know why you gave them the best rating. Either mine aren't made fresh, or its just not good meat, or both. In your review you said you could bend it a full 180 degrees... mine seems really dry. With the slightest bend, it cracks and when you bite into it, the taste just seems off. Not to mention, my original has a completely different color to it than your pic. I'm definitely really let down with this. If its supposed to be custom made, then I'd expect it to be fresh, not dry and with a strange taste. I'm going to see if I can get a refund. This is pretty much a waste of $150 in my book.